In October of 2017, I recklessly accepted the Inktober challenge. 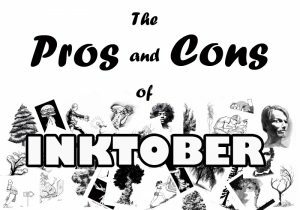 For those who don’t know, basically, the objective of Inktober is to publish a new drawing in ink on social media every day for the 31 days of October. The outlet can be Twitter, Facebook, Instagram or other social media. 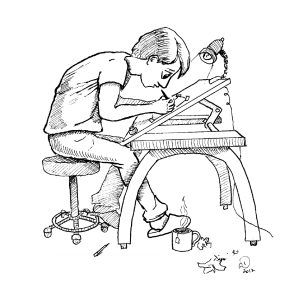 I chose to post on my Fabebook page and on Instagram (both are: @antondymtchenkoart). Needless to say, in the process, I discovered great benefits and some downsides to the challenge. Even though, in the end the pros greatly outnumber the cons, I wanted to share both sides of my experience. The greatest pro of Inktober, in my opinion, is a sharper work ethic. Taking part in such a challenge, with people waiting for your next publication every day, forces you to scan your oh-so-busy daily schedule with X-ray vision to pinpoint every single bit of downtime and turn it into productive drawing time. The process made me realize how many more bits of my time could be put to creative use under the right mindset. I didn’t even feel guilty about leaving parties before the moment when it’s socially acceptable to leave (is 9:30 p.m. too early?) because I knew I had an artistic undertaking to attend to. Pressure, it seems, has its benefits. For me, the medium of ink in itself was a step out of the comfort zone. Although, I did use it occasionally for sketching in the past (mostly markers), I never used it for an important production of works. Ink really teaches you how much you have to be in control of your hand. When you screw up a line, there is no going back, no erasing, no Alt-Ctrl-Z. A little white gouache can be used to cover up a minor mistake, but its efficiency is limited to small areas and tiny amounts (if you don’t want the white paint crust to be too apparent on your paper). Even when using a pencil underdrawing, going over everything in ink is a methodical exercise of control. A detail like the steadiness of your breath can have an impact on how the pen moves. But, if like me, you see the obstacles in your way as means to move forward, the use of ink is definitely a pro. Beyond work ethic and technique, Inktober can help diversify an artistic portfolio. Before the challenge, I had many “fine artsy” works in pencil, charcoal and oil but very few illustrative drawings. By the end of the challenge, I accumulated a decent scaffold for an illustrator’s portfolio. Moreover, some of my ideas, especially the ones with a tint of social commentary, had been sitting in my head for months and Inktober became the reason to put them on paper. Since this challenge is not only about doing but also sharing, it’s a great tool to grow your following on social media. Publishing quality content, every day, at the right time, with the right hashtags, made me ever more aware of the indispensable tool the internet can be for an artist. It helped me connect better with friends and strangers who enjoy my creations. Moreover, I discovered inspiring artists from all over the world partaking in this 31-day-drawing-bootcamp. I even had a fleeting feeling of cyber-camaraderie which encouraged me every day to continue on to the next drawing. In short, the social aspect of Inktober surely has its benefits, but what about the downsides? Inktober happens on social media. That’s the source of its main downside. Social media apps and sites (like Facebook, Instagram, Twitter, etc.) are capitalizing on eyeballs. Which means: they are designed to keep the biggest amount of eyeballs on them for the longest time possible. Tristan Harris explains, in his numerous articles interviews and speeches, that these companies actually employ psychologists to design the most addictive experience possible for the consumer. As Harris puts it in a Big Think interview: “This slot machine mechanic [of social media] is the best way of addicting people” It didn’t take long for me to pick up my phone, before brushing my teeth in the morning, to publish the next drawing and enjoy the high of how many red hearts or thumbs-up I got. Inktober doesn’t allow you to refrain from the online razzmatazz because you make a commitment to be there every day. And how can you not look forward to people liking your work? Isn’t that the main part of the reward? In the end, you can’t unplug. I found myself scrolling the Instagram feed and checking my phone way more often than necessary. I think I even checked my phone at least twice while writing this article. It fragmented my attention; the precious resource an artist (and actually, every human being) should nurture the most. In short, it’s important to consider that the pledge of daily exposure on platforms designed for addiction can impede the cultivation of deep concentration necessary for creative work. Aside from social media, the pressure of putting out a drawing a day can impede the natural development of an idea. Some ideas require days or weeks to come to full fruition. Some will require more than a couple of hours to execute. Inktober boosts your production but also traps you in a narrow time frame. I know I will be doing second more detailed versions of some of my drawings, spread over many days, to achieve the highest quality possible. Obviously, if you don’t want to compromise quality, you need to get more time, which ends up being cut out of your social life. If your social life is a big deal for you, get ready to make a month long sacrifice to the ink gods. You won’t skip work or go to school less because you have a set schedule. You won’t sleep less because you already sleep too little. So ultimately, you have to reduce what is reducible: your weekly dose of chin-wagging. I’d like to specify, this is a lot more challenging if you’re a total extrovert. As I mentioned above, I usually had no trouble walking out of parties and gathering. Although, there is one I regret missing. But hey, in the timeless words of the Rolling Stones: “You can’t always get what you waaant”! To conclude, I encourage any artist to try the Inktober challenge. Enjoy the struggle while being aware of the drawbacks. You might unlock a work ethic you didn’t know you had. And if you’re more into looking at art than making it, despite my harsh words about social media, feel free to send a comment, a thumbs-up or a red heart to works you like. You will be encouraging our production and our task will be not to get too addicted to your encouragement. Anton Dymtchenko © All rights reserved.